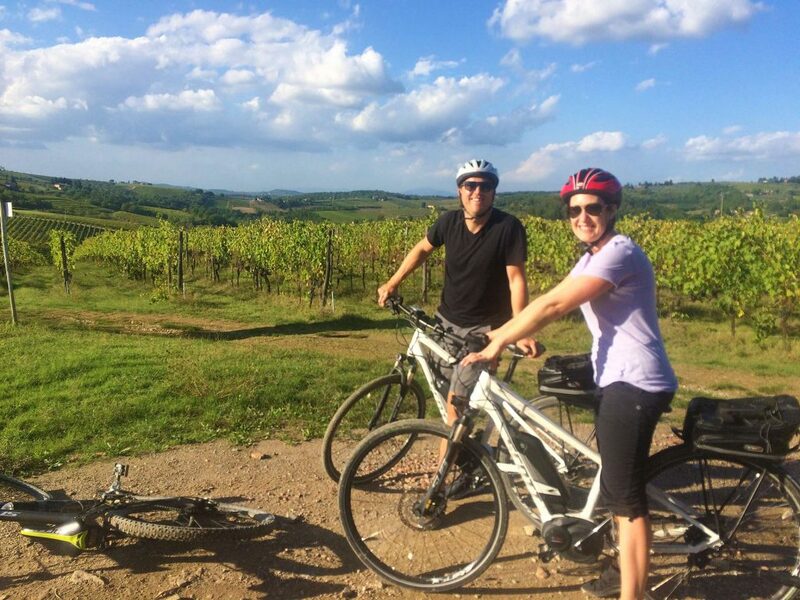 Join our Tuscany bike tour for a day and enjoy the beauty of rolling Tuscan hills while biking through vineyards and olive groves around castles and villas, taking home an unforgettable memory of one of the most scenic regions in Italy. This one-day bike tour ride is a great biking experience, not too long and not too short, and it is accessible to all level bikers. Those who are less trained can hop on a ‘magic’ bike where a small electric engine helps make it to the top of some of the hills. Since Tuscany is all quite hilly, even some of the more trained riders prefer to relax and enjoy the landscape by riding a magic bike for the day. Our bike tour in Tuscany starts when Luca meets up with you and helps you choose the right bike for the day and together you decide what caliber ride to do. Then you take off for an exhilarating day exploring local farms, riding through stone villages – coming across an open market every now and then- through vineyards and olive groves, and around castles and villas where noble families still live. Luca stops at key viewpoints for pictures and at some landmarks for interesting facts about local culture and traditions, plus an espresso break to give everyone a little extra shot of energy! Lunch is Italian style, a relaxing one-hour break (to recharge magic bike batteries) in an authentic Tuscan eatery for a hearty dish of pasta. The recommended choice is ‘pici’, a Tuscan noodle rolled thick and about 10 cm long, typically served with a ragout sauce which during hunting season is made with boar or hare. Other pasta favorites are potato tortelli sautéed with butter and sage or potato dumplings called ‘gnocchi’ (pronounced nee-oh-key) served with fresh basil pesto. The carb pick up is essential to continue pedaling on your one day bike tour of Tuscany. Once batteries are charged it’s back on the bikes for the ride back to home base. There is no way to describe the feeling you get when you are riding along roads bordered with tall cypress trees reaching up to the sky, or looking out at rows and rows of grape-clad vineyards, or gliding by shimmering olive trees that have been growing on the land for centuries. A glance across the valley to neighboring hilltops where bell towers still stand as testimony to the history and timelessness – that is Tuscany! Most roads travelled during your Tuscany bike tour are dirt and there is little or no traffic. Anytime there is a challenging uphill or downhill Luca makes sure you know all the right techniques to use, he is a certified biking instructor and he takes care that all riders pedal safely and make it back to home base in one piece. 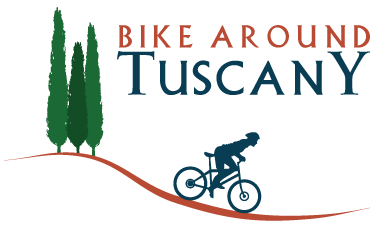 The one day Tuscany bike tour is about 20 kilometers (12 miles) and while it may seem like a small endeavor, it is undoubtedly the greatest experience you will ever have in Tuscany … or anywhere else for that matter!